Job engagement has received much concentration in both research and practice due to its potential impact on various organizational outcomes. The chapter explores the impact of organizational commitment and job engagement on organizational performance in IT industry. The questionnaire employed in this study consisted of job engagement variables and organizational commitment variables taken as independent variables while organizational performance variables as the dependent variable. Sample for the study consisted of 475 IT professionals from five IT organizations. Simple random sampling was used as a sampling technique, and this study was an ex-post in nature. Data were analyzed using mean and standard deviation, correlation, and multiple regression. The result revealed that the job engagement and organizational commitment significantly correlated with IT organizational performance and significantly impact the organizational performance of IT. For decades, researchers have been studying the factors influencing performance in IT organizations with emphasis on job factors and work environment factors. Personnel constitute the largest human resource element in IT services and therefore have a great impact on quality of IT and customers outcome (Abdullah, 2011). The progress and survival of any IT organization, no doubt, depends on its human capital and their contribution. The challenge of engaged and committed workforce has been reported by IT sector also (Suliman, & Lles, 2002; Ahmad & Oranye, 2010). IT organizations have also started considering their employees as a valuable asset. 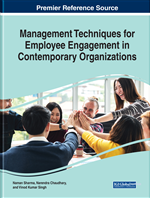 In recent years the concepts of job engagement and organizational commitment as mechanisms to improve organizational performance have been discussed fairly extensively in the management literature. Additionally, IT organizations are increasingly looking beyond financial performance measures, while focusing on how to bring higher quality care (Love et al., 2008). To remain competitive and gain positive business results, IT organizations also need to know the job engagement and organizational commitment of their personnel. Therefore, it is not surprising that human resource managers are consistently ranking the development of a job engaged workforce as an organizational priority (Shuck and Wollard, 2009). Harter et al. (2002) also suggested that engagement is important for meaningful business results and due to increasingly competitive business environment committed workforce has now become a matter of survival for every organization. Nowadays, IT organizations are centers of professional care provided by personnel and their contribution is considered indispensable in improving the IT service performance and conditions of the nation. Commitment of personnel has bearing on the quality of services they offer to people (Maheshwari, Bhat & Saha, 2008). So, the understanding of job engagement and commitment to the organizations and to the degree to which they contribute to boosting up their organizational performance is really important. Therefore, this study aimed to explore the impact of job engagement and organizational commitment on organizational performance in IT organizations. Also such empirical studies in Indian context are very few (Sharma & Garg, 2017) and hence the conduct of this study becomes even more relevant.